The “Colonies” listening device was clearly intended to meet the need for a mobile and rapidly deployable unit. The to be assembled components were transported on a vehicle towed two-wheel trailer to the observation location. In a very short time, the listening device could be assembled and deployed. The light and compact combination was a striking contrast to the heavy foreign equipment. In addition, the manufacturing costs were considerably lower. The first development of the two axle listening device model Colonies started in 1932. In 1933, the combination of a listening device, viewing device, and searchlight was developed to which the electric data transmission was added in 1934. Binoculars coupled to an accompanying transmission system (viewing device) were provided with these listening devices. The transmission comprised the electrical transport from map angle and elevation from the listening device to the viewing device, and from the viewing device to a searchlight. In 1936, six complete listening devices type Colonies were delivered to the Royal Netherlands East Indies Army (KNIL). The equipment Colonies worked operationally well as compared to the operational experiences of the military using the Dutch Army listening devices at the homeland. We have also heard this statement from veterans. According to them, the listening devices were not used much in the Netherlands. This is probably largely due to the difference in operations. This conclusion has been confirmed by veterans. The Dutch Army listening devices were not equipped with a cylindrical plane table board and a transfer system, the so-called STEP system. The Colonies listening device had both additions. A first requirement for the use of a listening device was a position in a very quiet environment where noise is eliminated as much as possible. In the case of the Colonies device, the complete observation and setting operation could be carried out without persons speaking in the neighbourhood of the device. When the operator had located sound and the command “ready” was given a touch of a button, the map and elevation angle data were presented at both the binocular viewing device and the searchlight. Operation of the Dutch Army listening devices at the homeland required oral communication of every observed bearing and elevation to the operator of the listening device added angle measuring table (a flat plane table board, see picture below). This procedure was repeated twice more. By extrapolation on the series of these three observations, the true position of the target was obtained. The operator of the angle measurement table then transferred the map angle and elevation by telephone to the searchlight. Setting up the searchlight could only start after receiving that data. This entire procedure obviously lasted much longer than with the Colonies device. Moreover, the listener and the operator of the angle measuring table spoke near the listening device. This could be so disturbing to the listener that he lost the target. The museum Waalsdorp crew discovered that the Luchtdoelartilleriemuseum (Anti-Aircraft Artillery) has a listening device on display. The listening device has clear characteristics of the earlier Van Soest design, but the device had two floors. The upper floor obviously for the listener and the bottom floor for the reader of the corrector. The top floor was exactly the same as the listening device model van Soest as previously known to museum Waalsdorp. 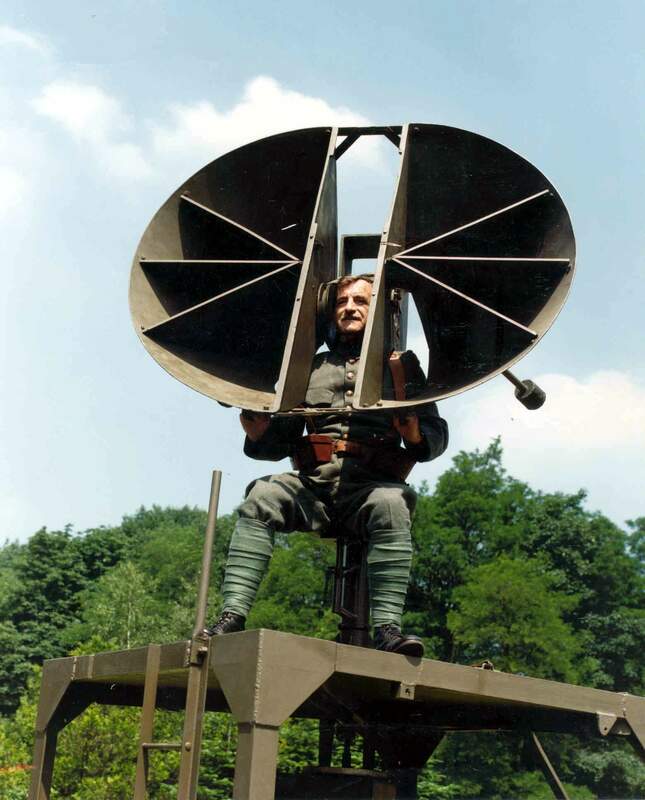 The managers of the Luchtdoelartilleriemuseum could only indicate that the device was called the listening device Van Soest. The text shows that this listening device was not equipped with the Step system. Why this was not the case, we only discovered later. After this visit to the Luchtdoelartilleriemuseum, the Van Soest archives were searched for clues. A report by Sergeant Scheltens was found about a listening device for which he tabled a very long list of defects. This report contained issues that were not clear to us based on prior knowledge from the archives without having seen the two-floor device. After that, the remarks and complaints became clear: “Because of the high build-up it has become top-heavy and therefore difficult to control in uneven terrain“, “Sharp corners in the cabin, plane table board reader bumps himself“, and “The plane table board reader sitting on the lower floor seat tramples the telephone connector too easily”. The Scheltens’ report was presented to Van Soest with an accompanying letter by Ir.F.J. Ribbius, the Commander of the VII Zoeklicht Afdeling tegen luchtdoelen (search light division against air targets) dated November 17, 1939. 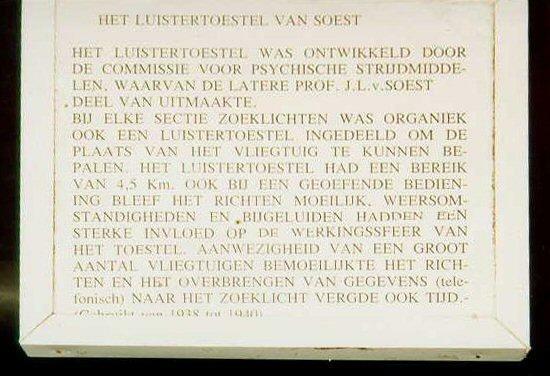 This letter refers to the listening device as the “Van Soest three”. Ribbius called in the help of Van Soest to solve the problems that had arisen during the device production by the Artillery-Inrichtingen. On November 22, 1939, Van Soest replies “Thanks for the Scheltens report, with my compliment to the content. I will make good use of it during the discussion on Friday in Delft (at the Artillery-Inrichtingen)”. The problems were apparently partially solved at a given moment. On January 15, 1940, the second letter from Ribbius follows with a new but now shorter deficiency report by Sgt. Scheltens. One interesting remark is: “The bag in which the accessories, such as earpads, pencil pens, etc. are stored, is at the front of the ladder at a very unfavourable place“. The listening device in the Luchtdoelartilleriemuseum has a ladder. In the second letter, Ribbius speaks about “your three-axle namesake”. The Luchtdoelartilleriemuseum could not give a good explanation of the three-axle notion. Only later, the how and why of the three-axle model became apparent. We do not know whether the listening devices were operationally useful in the air battle before the capitulation. Veterans have not given us a clear answer. In the operations of the three-axis listening device, the altitude angle was determined first after which the searchlight could start swinging, and a more accurate determination of the position of the target was then no longer required. The archives of the Artillerie-Institutions (AI) contains many letters from the AI to the Ministry of Colonies about the delivery of listening devices Van Soest model 1935. This shows that these listening devices were supplied with puncture and writing devices. With these listening devices, targets could therefore also be followed on paper. The letters show that the speeds of the aircraft increased fast in the course of time. In 1935, the tables for the acoustic correction had to be carried out to flight speeds of 100 km/h. In 1936, a table up to 500 km/h was asked for. This development led to the development and construction of the three-axle vehicles. From the letters, it appears that the firm van Heijst located at the Waldorpstraat in The Hague, The Netherlands was the builder of listening devices model Van Soest. There are also drawings of acoustic listening devices marked AI production, Van Heijst Bouw. The second drawing dated 03-01-1940 (Van Heijst) is of a three-axle listening device model Soest in a completely different design than the one we knew of. We cannot figure out whether these listening devices were in production before World War II. The last design is less high than the earlier three-axle model. The reader sits with his head behind the listener’s feet. How the position of the tracking plane is obtained can be better understood from this drawing, in contrast to the previous three-axis type. The device probably was equipped with a horizontally mounted round plane table board. Finally, a thin report was found in the Van Soest archives with a text written by Van Soest dated April 1935. It describes two three-axis systems: one using the Utrecht and the other the Waalsdorp method. The listening device in the Luchtdoelartilleriemuseum worked according to the Utrecht method. Despite his explanation, we still do not understand how the Utrecht method works. The Waalsdorp method worked on the original Van Soest-cylindrical plane table board. After three observations or after a briefly recorded track, the best fitting flight curve had to be applied to these observations. Subsequently, at the highest point of the curve, the arrowhead, the elevation and the map angle of the passing point were read. This elevation and the angle perpendicular to the map angle provided the angles for the altitude plane on which the three-axle searchlight had to be set. Why the original Van Soest listening device has not been used to determine the altitude plane is not clear. The Utrecht method: When the listener shell is moved, the arrowhead P moves correspondingly over the inner surface of an imaginary hemispherical plane table board. For the recording of an altitude plane using three axes, at least two observation points are required. Therefore, there must be a memory function for the earlier observations. Perhaps there are two arrows P1 and P2, which, if the listener has observed the target, had to be fixated successively. The two arrows are projected by a parallel light beam onto the frosted glass plate with a protractor. The reader turns the observation box horizontally until the projection of both arrowheads is on one of the beamlines of the protractor. At the end of the beamline, the elevation can be read. The chart angle protractor on the observation box provided the map angle of the. Here we are dealing with a puncturing system. How the observed information was kept in the Utrecht method system is yet not clear. The conclusion of the recent archive studies is that Van Soest is the inventor of the three-axis method. In the first three-axis listening devices, the Utrecht system is only found in 1939. At the end of the ‘thirties’, it became obvious that the acoustic direction determination no longer could cope with the increasing speed of aircraft given the slow speed of sound. The devices would become obsolete soon. The discovery in the Measurement Building of radio reflexion by aircraft in 1937 was therefore used to remove this deficiency. The result was an “electric listening device” (later called Radar) of which the first pre-production models were ready in the first months of 1940 before the German invasion.